Daydreaming about your next big trip? If you’re preparing to escape to a tropical paradise filled with aquamarine views, boat drinks, and island music, you’re probably preparing for some time out on the ocean too. Is there anything better than having sun-kissed skin at the end of the day while you take in the sunset and remember stunning views of incredible ocean life? Whether you choose to scuba or snorkel on your trip it’s an experience you won’t forget. Or maybe you’re thinking of getting in the water closer to home. You could even be preparing to dive a local shipwreck or head out for some spearfishing. Have a specific goal in mind? Just learning and are unsure about the timing, costs, and equipment you will need? It can be confusing to choose between scuba or snorkel. They’re both great. Sure, if you are planning your trip around the best spots to snorkel in the Carribean, or if you have a specific shipwreck in mind you need to see, the choice is clear. But for the rest of us, picking between two great ideas isn’t always easy. Don’t worry. We’ve got you. Review our list of tips and we’ll help you decide if you want to scuba or snorkel. You’ll be in the water before you know it. Anyone who has done any snorkeling or scuba diving can tell you that we do it for the view. Getting a clear look at the amazing world beneath the surface is enough to keep us coming back for more. In fact, many newcomers to snorkel or scuba are attracted to the sport because of the enthusiasm of their friends. But when choosing Scuba or snorkel some guess that the view is always better when Scuba diving. This simply isn’t the case. True, if you want to get a 360-degree view of the underwater world, scuba can’t be beaten. You’ll be submerged in the water and exploring depths impossible to see beneath the surface. But in many Carribean and tropical spots, including diving on reefs, you don’t need to get very deep to see the best of the underwater world. Plus, many scuba divers miss looking up. With snorkeling, you have a full view beneath the surface. Even if you can’t see the depths, you may not need to. The best snorkeling spots feature crystal clear water and unhindered views of tropical fish, plants, and coral. Trust the local customs, and consider your goals. You’ll get a good picture if you should scuba or snorkel that way. Once you decide what you want to look at you’ll know which gear you require for getting out on the water. But because the gear you’ll need for scuba or snorkel is completely different it may affect your decision as well. It’s important to get good equipment whether you choose scuba or snorkel. There’s nothing worse than a leaky mask or breathing tube that’s impossible to clear. With all of the equipment scuba or snorkeling requires you’ll want to feel comfortable before you begin. Before you get in the water you want to make sure you have all the training you need. And while beginners can learn to scuba as well as snorkel the amount of prep time is different. You’ll have to know how to swim to start snorkeling. But beyond swimming ability and comfort in the water, there is no specialized training for snorkeling. Of course, you’ll want to have someone show you the basics of how to use your gear if you’re uncomfortable. A good dive shop should help. One thing some of us which we’d been told when we were first starting out snorkeling is to wear socks with your fins. It will cut down on blisters. As you’ll be spending most of your time submerged beneath the surface, scuba requires special training. Don’t let that scare you off though if you’re looking forward to scuba diving. Many resorts and dive shops have a training course they use to get you comfortable and out on the water as fast and safely as possible. Their trained and experienced professionals will get you ready to dive. If you are staying at a resort, they may have a training course to get you out on the water. This course will cover basic safety topics about how to use your equipment properly, what to expect underwater, and how to respond to situations in the water. They’ll teach you to read and use your air gauge so you know how much air you have. They’ll also cover using a buoyancy compensator to adjust your depth and how to clear your ears as pressure changes. While these courses will help you get out on the water and enjoy a dive they aren’t the same as getting certified. Before your trip or day on the water review if you’ll need certification locally before you start. Many begin scuba diving with a local course and choose to get certified after. They want to be able to scuba dive as much as possible! Are Scuba Diving and Snorkeling Dangerous? Many newcomers to scuba or snorkel are scared off because they think they might be too dangerous. As the underwater world can seem so mysterious their fears can get the best of them. While any activity on the water can be dangerous if you’re not careful and properly trained, there are a number of ways to stay safe out there. Whether you choose scuba or snorkeling they each have their own unique risks. Understand the risks, and you can take special care to avoid them. As you’ll review in your safety course before you start, scuba poses risks.decompression sickness, nitrogen narcosis, oxygen toxicity, refraction and underwater vision. But good preparation means your training will teach you how to avoid these issues. There are dangers to snorkeling as well. Also, make sure you or your tour raises a dive flag when snorkeling. You want to avoid a collision with a boat or jet ski. Looking to work for your supper? Both snorkeling and scuba diving offer the ability to catch lobsters or enjoy spearfishing. Of course, in both cases, you will definitely need additional equipment. You’ll also need to review the local fishing licenses of your dive location. For lobstering and spear fishing being able to stay submerged may let your dinner options grow. But the mobility and ease of snorkeling have also allowed many a fisherman to hoist a feast from the water. In either case, you can have great fun fishing and lobstering. Heading to an island paradise and short on time? You can grab your fins, breathing tube, and mask and be snorkeling right away. If your trip will be short on time, snorkeling takes the edge. With the equipment and services required scuba is definitely more expensive than snorkeling. But whether you are choosing to scuba or snorkel you may want to invest in a boat trip to get you out to the best spots. We also strongly suggest you invest in great equipment. You’ll make the most of your day. What’s better, snorkel or Scuba? The answer is yes! 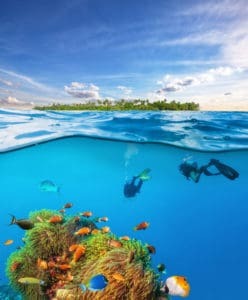 For those of us who love spending time on the water both Scuba diving as well as snorkeling offer hours of enjoyment for seeing ocean life, fishing, enjoying the views and relaxing in the invigorating atmosphere of the sea. And while each offers distinct advantages in terms of equipment, possibilities, prep time, and training, they are both a blast to do. Unfortunately, for beginners, the quest for the right gear and advice can be overwhelming. Pushy salespeople may try and sell you equipment and service you don’t need. Or you may be so enthusiastic to get going you want to buy every mask in the shop! There are great products out there that can help you enjoy your first attempts at Scuba diving and snorkeling. Considering your budget, timing, prep time, and goals before choosing between snorkeling and scuba will determine which you should try this go around. But whatever you do, you should eventually try both. We’ll choose both. And you should do. Getting expert advice when beginning, moving to the next level, or preparing to make a sizable investing in Scuba and snorkeling can make a huge difference. At Moving-Living we offer expert advice. From information about new and special products and how-to guides to great stories and anecdotes, we’ve got you covered. Doing a lot of window shopping and have questions about your next purchase? Getting ready for a big trip? Let us help. Don’t wait. Contact Moving-Living today. We will help you prepare for hours of enjoyment out on the water.